Not all websites have identical goals of online sales or generating revenue, but every website has or at least should have a very distinct and measurable goal. This should mostly be the primary, if not the only metric for you to measure SEO success. 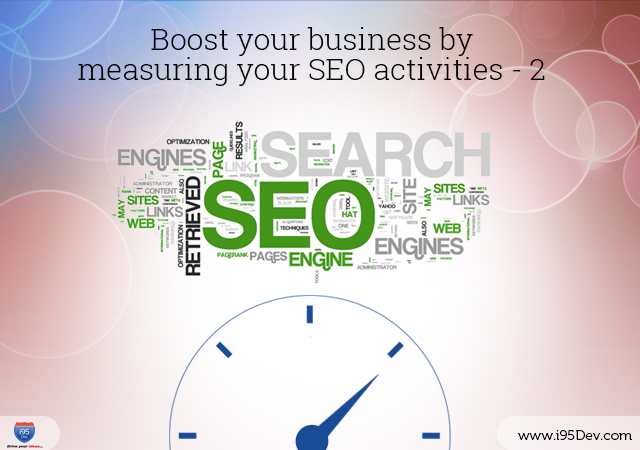 We have discussed the initial step of measuring SEO meticulously in our first blog Boost your business by measuring your SEO activities – 1. The next step for you is to make sure that your website’s true goals are effectively tracked and monitored, as without this data you can hardly measure or report the progress of a SEO campaign. As we move on with the last part of the 2 blog series, we discuss on how to track down your goals by Google Analytics and measure success of your SEO campaigns. If your ecommerce website allows customers to buy and pay online, your website’s payments related information is best measured by Ecommerce Tracking. In case you website’s goal is not related to online revenue and purchases, Goal Tracking is the suitable way as it measures every time a visitor completes an anticipated action. You can track different actions as Goals in Google Analytics and can weight them according to the business conditions by assigning optional values for each. In a way, you can set up tracking of contact form completions and call tracking such that if you find phone calls to be more valuable to your business than contact form enquiries, you can assign a value of 1 to phone calls and 2 to contact form completions. It is fairly easy to set up Goals in Google Analytics; plus, it gives a clear conversion data to measure your SEO’s success metric. On the other hand, Ecommerce Tracking is a bit more complicated to set up and is recommended to be done by an experienced web developer. To know more, read the official Google resource. All you need to know is the purpose of your website; and when you recognize the true objective of its existence and you track these goals using Google Analytics, you are on the right track to measure the progress of your SEO campaign and more efficiently evaluating its successes and failures. An increase in Organic traffic is good only when it contributes to the fundamental objective of the website. And when you track organic traffic, you can measure its impact on your goals or revenue and check if that is improving. But point to note, Organic traffic alone is just a small part of the picture and is not the only traffic source resulting from a SEO campaign. You can even look for referral and social sources to find out the impact of the campaign. Success metrics such as conversions from organic traffic sources, referrals and social sources helps to measure SEO activities appropriately. In case, you have good backlinks and greater social engagements as an outcome of the campaign, you will definitely find this reflecting in your goals and revenue statistics for your website.